You might think the scars are signs of mining, but they’re not! The natural hydrothermal scars date back to interglacial periods and are evidence of abundant surface water speeding the dissolution of pyrite, and freeze/thaw cycles destabilizing the rock of this mineral-rich mountain. Almagre is a word with Arabic roots dating to Moorish Spain, meaning red ochre. Though the scars are more yellow than red, it is the red color that is prized for paint, and that rinses out of the rock to color the river. Our history is a living history. Every Questeño knows the Tewa of Taos Pueblo ride horseback through the mountains to Almagre each summer. The mineral it offers has sacred relevance still. A Cultural Easement with the Forest Service allows for this unbroken tradition. The remote Rio Grande Valley, in the relatively remote southwest–and in a historically remote continent–preserved a version of Spanish that most Spaniards in Spain today would not recognize. Taos historian and linguist Larry Torres likens this to a British person returning to England in the current day, but speaking Chaucer’s English. This region’s isolation built strong do-it-yourself practices of crafts, art, religion, and more. But with its general lack of a literary culture, influence of the spoken word had more impact than the evolving and more formal language-use residents would have encountered in books over time. The first Spanish inhabitants of New Mexico and southern Colorado spoke 16th-century versions of Castilian, and to a lesser extent Andalusian, Galician, and Portuguese dialects. And these became represented by different chronological stages of speech. Constant immigration to the Americas continued from Spain into the mid-1800s. Even more interesting is the fact that Castilian was already a very conservative language, with less of the natural alterations and growth that was seen in other European languages with Roman roots. Spain was more geographically isolated in its Iberian Peninsula location, with less influence from the neighboring dialects of Europe, or its cultural influences. One linguistic influence that much of the Iberian Peninsula did experience, however, was as a result of its 500 years under Arabic rule. 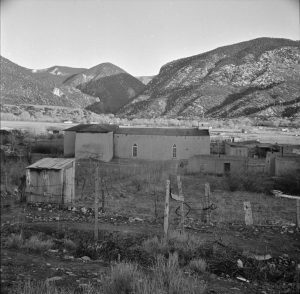 Spanish immigration to the Americas began so soon after Arabic control was pushed back into North Africa that many words with Arabic origin were still in common use, and remain so today in northern New Mexico–words such as acequia and almagre, as noted in the Questa History & Community Trail. The Nahuatl language of the Aztecs was the most prominent language that immigrants encountered in the Americas. Many words of these natives of Mexico made their way into common usage as settlers moved north into the Rio Grande Valley. Less commonly used are words from Navajo, Ute or Comanche languages, although some prominent words are still in use today. Each autumn, Questa has a harvest-time festival with its roots in the trade-fair tradition of the region. This is called a cambalache; a word that is Comanche in origin. 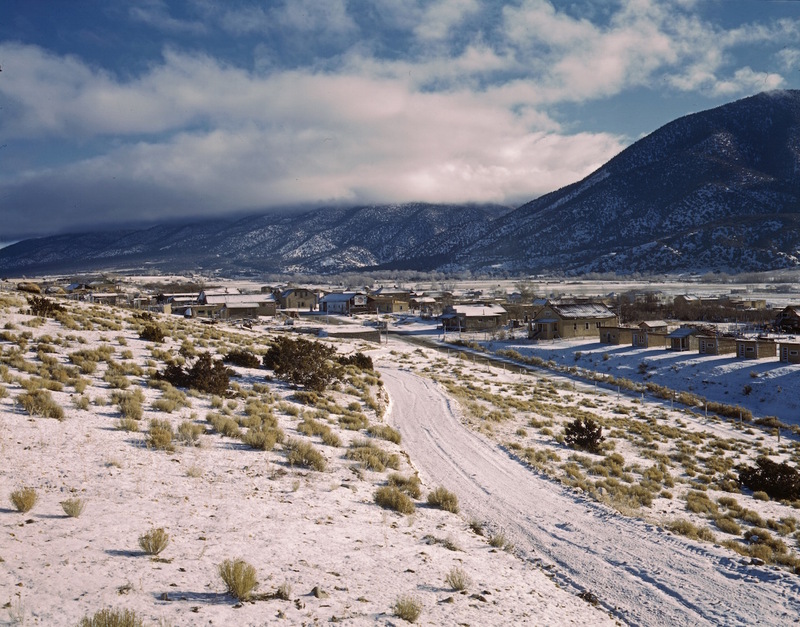 By the mid-1800s, residents of New Mexico had also been in contact with a growing number of English speakers, and this impacted the language and vocabulary of the area. As with other influences, there is less structural change from the archaic Castilian roots, than simple additions of words for which there was or is not a Spanish equivalent. After centuries of archaic Spanish, with its additions of Arabic, then its inclusion of Nahuatl, and the occasional word from the Plains, Questa’s language is evolving. Would you like to record the stories of your elders for our oral-history cache? Contact us at QuestaStories.org. Questa has a unique culture to preserve and history to share. Over twenty hydrothermal alteration scars occur in two bands of elevation (3200 – 2900 and 2800 – 2600 m amsl) along the Red River Valley between the towns of Red River and Questa in northern New Mexico. These elevations correspond to hanging valleys on the north facing slopes and sharp changes of relief on the margins of the Red River Valley. Scars are the locus of sporadic mass movements and contribute to water quality degradation of the Red River. The amphitheater-like scars form over highly fractured areas of extensive quartz-sericite-pyrite ± kaolinite-alunite alteration. Alunite from the Hottentot scar yielded a 40Ar/39Ar age of 24.96 ± 0.16 Ma, slightly older than mineralization at the Questa molybdenum deposit. The presence of alunite suggests that hydrothermal alteration of at least this scar is different from that associated with molybdenum mineralization at the Questa Molybdenum mine. This is also reflected in different d34SCDT pyrite between the deposit (0.0 %o) and scars (-1.7 to -11 %o). Development of the alteration scars on the landscape began at least 1.85 Ma based on 40Ar/39Ar ages of jarosite from ferricrete at high elevation on the margin of the Goat Hill scar. Ferricretes at the base of the lowest elevation scars yield 40Ar/39Ar maximum ages as young as 0.34 ± 0.16 Ma. Five other ages within this range mark periods of increased erosion in the Red River Valley. The spectrum of seven 40Ar/39Ar ages yielded from different scars generally coincides with geomorphic surface ages established by other workers. These geomorphic and radiometric ages are best correlated to interglacial periods, during which times abundant surface water probably enhanced the oxidation of the pyrite in their host rocks. 1LUETH, V.W.,1PETERS, L., 2CAMPBELL, A.R., 1DONAHUE, K. and 1MCLEMORE, V.T., AND 3WALKER, B.M. Questa History and Community Trail Group, is citizen-led and local. Deeply inspired by Saint Anthony’s Church restoration, we move forward to restore and beautify. Photograph: John Collier, Questa 1943 FSA/OWI, archived at the Library of Congress.